At the new flagship Pencoed Primary School near Bridgend in Wales work on their new school develpoment has now been completed. 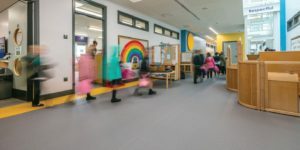 When the school needed flooring for the project they turned to international flooring specialists Gerflor to deliver a fantastic selection of fit for purpose, futureproof solutions. 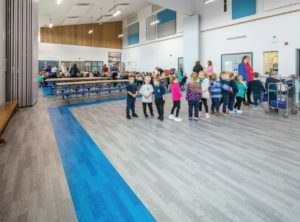 The range of Gerflor products included their award-winning Taralay Impression Control and Taralay Impression Comfort, their Tarasafe Ultra and Ultra H20 together with Mural Calypso shower wall and 300m2 of Taraflex Multi Use sports floori.